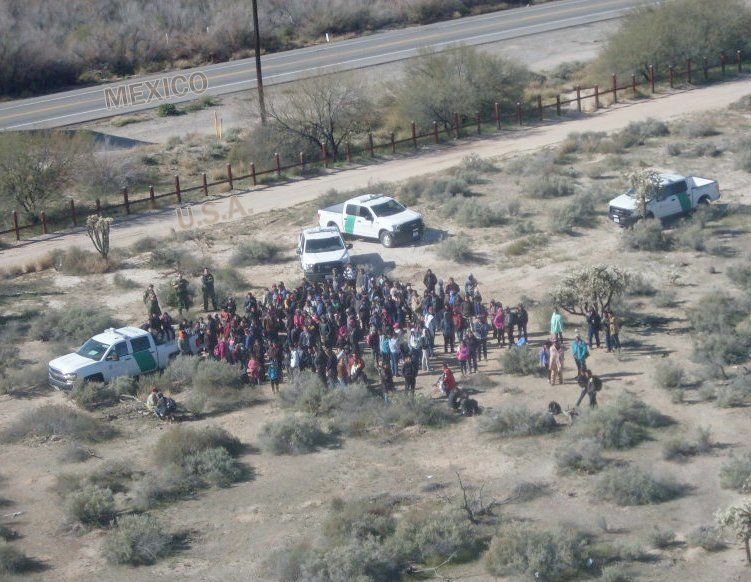 Yuma Sector Border Patrol agents apprehended nearly 750 undocumented migrants, mostly from Central America over the weekend. Many of the migrants required medical attention. Customs and Border Protection agents reported that s majority of the migrants were in family groups from Central America and were arrested after they walked through the Colorado River vehicle barriers near Yuma where they surrendered to agents. Roughly 87 percent of the migrants arrested were Guatemalan while the remaining were from Mexico, Honduras, El Salvador and Ecuador. Medical treatment was provided to 137 of the migrants found this weekend, either through medically certified agents, contract medical personnel at the stations or by transporting them to local hospitals. Some of the medical issues included pregnancy complications, lacerations, blisters, respiratory issues, chicken pox, lice and scabies. So far, in Fiscal Year 2019, the Yuma Sector has seen a 230 percent increase in family unit apprehensions and a 36 percent increase in unaccompanied migrant children apprehensions when compared to the same period last year. Yuma Sector Border Patrol agents arrest people from 9 Countries in the past 7 days! This is an example of how the borders are being overwhelmed and why we need a wall in place so that people who come in legally are treated fairly.